The Iridium Africa Plan provides discounted airtime rates for customers using their Iridium satellite phones from Africa. No monthly fees, no additional charges, no credit checks, no security deposits, valid for 1 year! 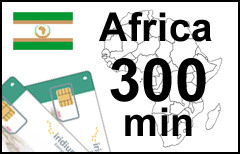 The Africa Plan can be used with any Iridium satellite phone, but ONLY within Africa. It WILL NOT work outside the African continent. The account can be refilled with a new Africa voucher as often and as many times as needed. All unused minutes will be rolled over to the new voucher, provided the new voucher is loaded before expiration date of the previous one. Calls to rare destinations such as other satellite systems, premium numbers, etc. are more expensive and will result in quicker depletion of included minutes. NOTE: Do not purchase a new plan if you want to add more minutes to your existing Iridium account with SATTRANS. Get a new Iridium airtime voucher instead.